Chef Mak of Tim Ho Wan is here 5 days at Feng Shui Inn (RWS)! Chef Mak Kwai Pui (麦桂培) of Tim Ho Wan (添好运) fame is in Singapore! Yes, his dim sum draws queues from around the world at his one Michelin starred "hole-in-the-wall" eatery in Mongkok, Hong Kong (now with second branch in Sham Shui Po). 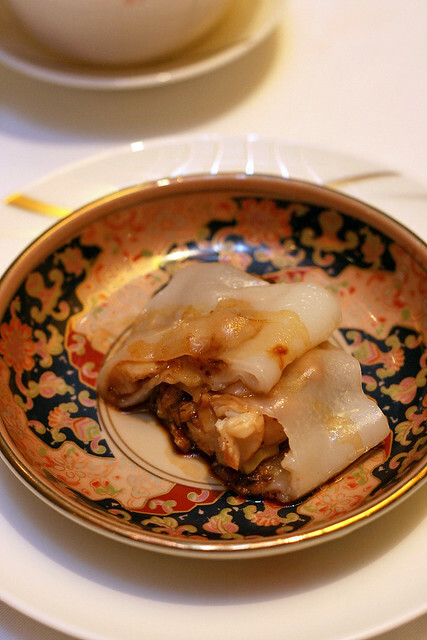 He was previously with three Michelin starred restaurant Lung King Heen which is also famous for its dim sum. Chef Mak is here for five days (30 June to 4 July 2011) at the invitation of Resorts World Sentosa (RWS) to offer his dim sum at Feng Shui Inn, Crockfords Tower. It's part of their Global Gourmet Kitchen series which aims to bring celebrity and acclaimed chefs to their restaurants for joint collaborations. Some of you will know I went looking for Tim Ho Wan last year in Hong Kong, but missed it right under my nose. So it is such a pleasure for me to not only get to taste the dim sum right here, but meet the master chef himself. I was pleasantly surprised by how sweet, cheery and unpretentious he is. Despite his awards and being named by CNN as one of the top 25 most influential Asians, he remains unfazed, humble and down-to-earth. We asked him so many questions. He is refreshingly frank and does not sugar-coat his answers. You know, all so often we love to wax lyrical about chefs and their passion for cooking leading them into the profession with stellar results. Chef Mak had no choice but to follow the family trade. His father and uncle were dim sum chefs. Here is a man who learnt his trade and learnt it well. Making dim sum is hard work that few youngsters will do today. But we are still grateful he dedicated his life to dim sum excellence. These are some of the highlights you can look forward to at Feng Shui Inn while he is guest chef here. 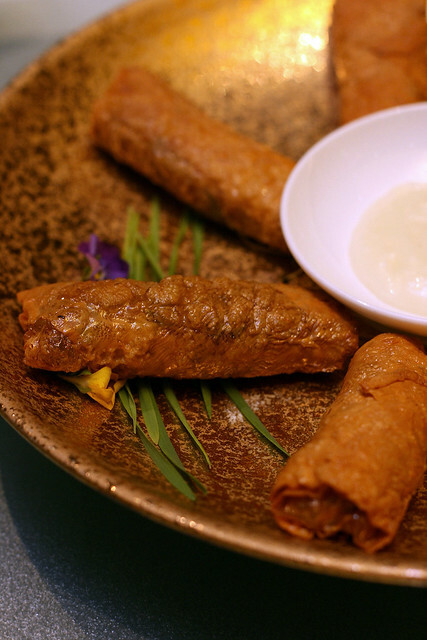 There are specialty dim sum and 8-course set menus available until 10 July. 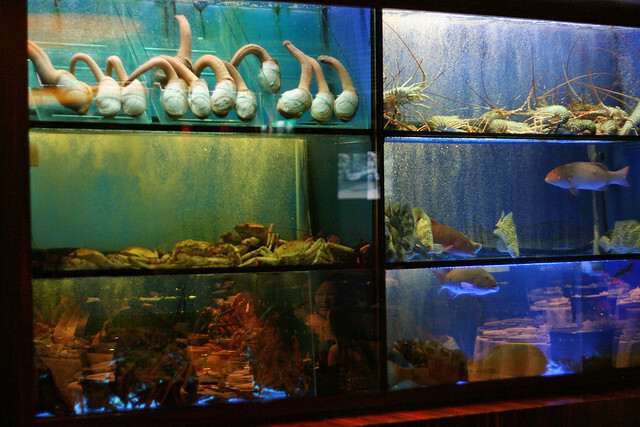 Feng Shui Inn also came up with auspicious names to celebrate these dishes. Yes! 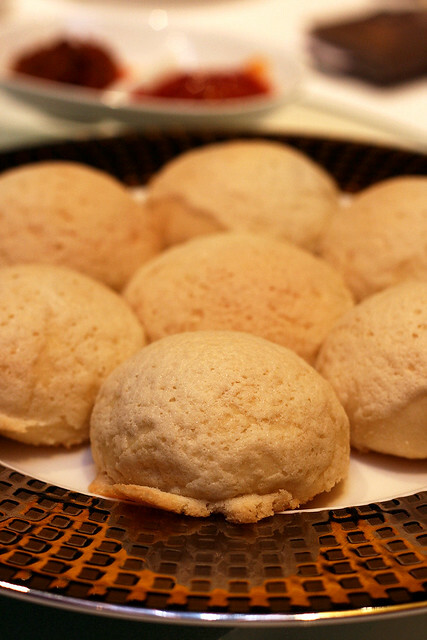 The famous crispy char siu bao are here! What a lovely sight. These are somewhat like polo/bolo buns. In Hong Kong, only 750 of these are served each day, and it's a limited run over here at RWS as well. Each guest is allowed four pieces max, and no takeaway is available. Baked lightly golden and topped with a delicately crispy sugar-glazed crust, each of these buns hold intensely flavourful char siu marinated in Chef Mak's secret recipe sauce. It's served piping hot, and this is really potent stuff! These were also very good. The abalone comes from Hong Kong and is well-braised in a rich sauce. 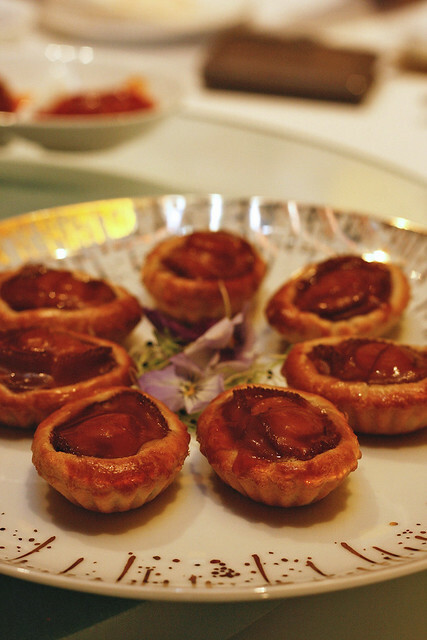 Diced chicken pieces sit below the abalone in the pastry shells. Each pastry tart has been conveniently sliced in half, so it's easy to eat. But be careful, it's also piping hot! These were gorgeously crisp, and it takes skill to get them that way without the vegetable juices making the skin soggy. Chef chose crunchy vegetables, and balanced them with just the right amount of sauce. 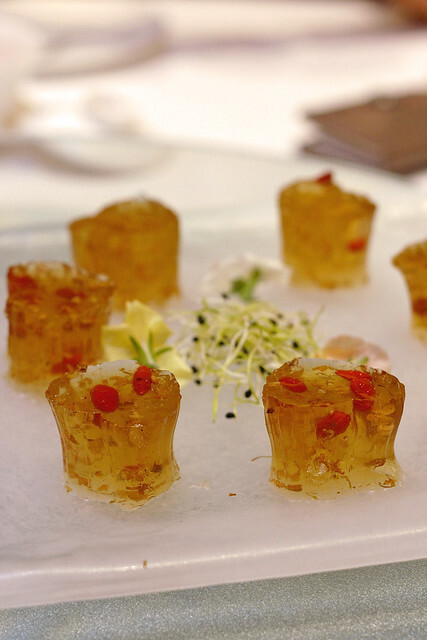 A very nice take on vegetable crystal dumplings. The skin is beautifully made, soft but gently chewy and the diced vegetables inside still crunchy and sweet. You can taste the Szechuan hot and sour flavours in every bite. Plump, juicy and delicious. This is one of my favourite dishes here. It's unlike any other lor mai kai in that it includes goose liver sausage (see dark maroon thing on top). That little piece is incredibly savoury, with a strong hint of wine. The sausage fragrance is infused in the rice too. Apparently, this is the traditional way 'lor mai kai' is done but is rarely seen these days. 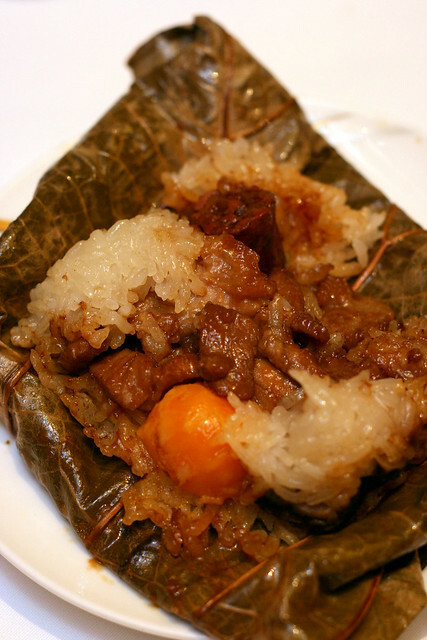 We all loved that the glutinous rice isn't steamed til mush. It's soft but still with a bit of bite. Perfect. 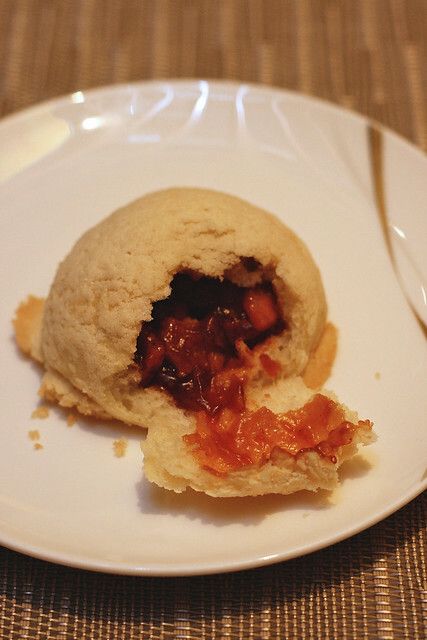 Note: In Hong Kong, Chef Mak is affectionately known as "Pui Gor" (Cantonese for Brother Pui) or "Pei Ge" (Mandarin). So some dishes here bear his nickname. 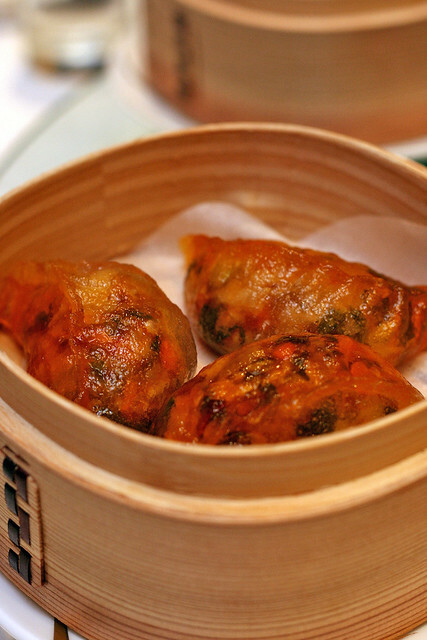 Siew mai is a staple dim sum item, but it's usually not my favourite. This one had lean pieces of pork and chopped shrimp. Strangely, the pork tastes exactly like pork tastes in Hong Kong! I assume this is a tasting portion. Tim Ho Wan is well known for its cheong fun (rice rolls) too. I liked that it is only the lobster that's doused in black bean sauce, and not the whole rice roll. So the sauce does not overpower the whole dish. Very nice and fresh. By the way, Feng Shui Inn bought new Japanese crockery just to showcase Chef Mak's dim sum! These were small but lovely. 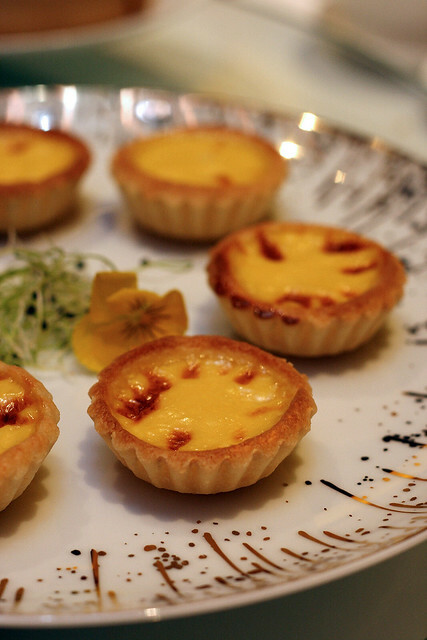 The shortcrust pastry is fragrant and the custard just melts in your mouth. Refreshingly cold and firm, this was a nice way to end the meal. We asked Chef Mak if he adapted any of his dim sum for Singapore diners, but he says he's staying faithful to the Hong Kong standards, as it's been proven that's what people like. He gets a lot of Singaporean and Malaysian customers lining up first thing in the mornings (yes, don't we love queueing!). He says he recognises our English accents. Chef Mak's creations will be available at Feng Shui Inn from 11.30am to 11pm daily, from now til 10 July 2011. Sure, prices may be more than what you'd pay at Tim Ho Wan, but you're enjoying this in a luxurious restaurant setting with table service...and most importantly, without the need to queue for hours or fly to Hong Kong! If you have never been to Feng Shui Inn, I think it's worth a visit. 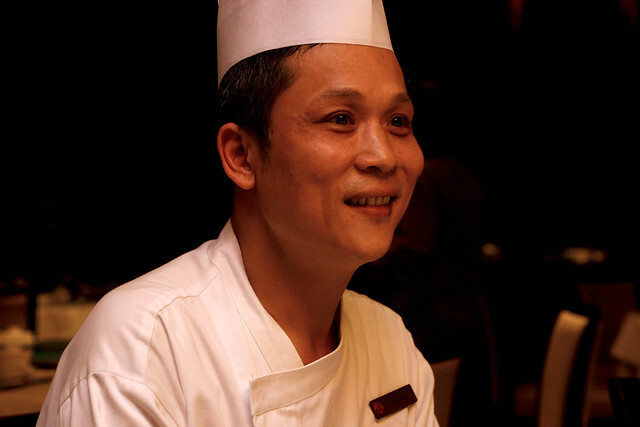 Its executive chef is Li Kwok Kwong, who came over after 20 years at Wah Lok Restaurant (Carlton Hotel). We also got to meet him, and he's another great personality. I would love to come back and try his dim sum as well. Most grateful thanks to RWS for bringing Chef Mak to Singapore. And big thanks to Tania of RWS and Khushil of Weber Shandwick for inviting me to sample the "Michelin star" dim sum and to meet such a wonderful chef. And now I can say I know what Tim Ho Wan dim sum tastes like. 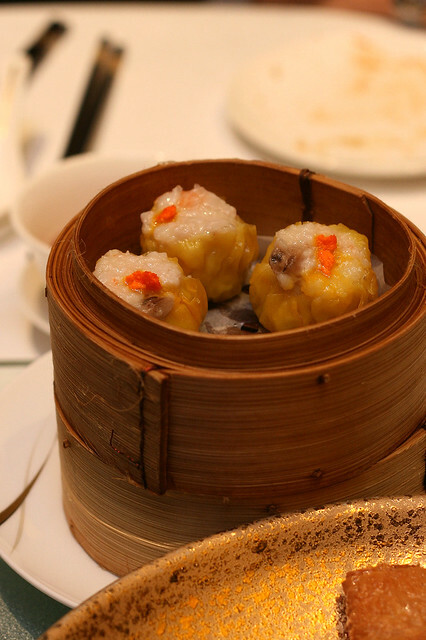 The Michelin star promotional dim sum is available from 11.30am to 11pm. Oooo. He's here. The Baked Barbecued Honey Pork Pastry was so so so good! Haa...you got lucky! Depends on what time you go, I guess. I hear waiting periods can range from half hour to 2 hours! I just went HK 2wks ago and I went to Tim Ho Wan twice!!! Queued before they were opened for business and waited for an average of 1.5hrs each time. But totally worth it! Went there last week. 1 hour queue for me! The char siew pastry and rice roll is to die for. Others taste normal. I was there 3 weeks ago! The queue was madness. Thankfully we stayed 15mins walk away so my dad queued for a number and went back to the hotel to rest till it was almost time. Rain or shine, these foodies queued. The polo pao was AWESOME! Crisp on the outside and chockful of flavours on the inside. The Siew mai had great texture. The malai kou (Malay cake) was so soft, moist and fragrant, unlike anything you can get here in Singapore. I went there for dinner and subsequently went back for brunch the next day. It's DA BOMB!!! Neko_Peng, Keke, Tricia...you guys are lucky to have tried the real thing in HK! Lynn: Chef Mak has actually trained the staff at Feng Shui Inn on how to make the dim sum, but they have an agreement to only serve it until 10 July. I guess after that the Neuralyzer (MIB flashy thingy) comes out and memories are erased. Win a Villa Stay on Bintan Worth S$750!